"Chose promise, chose due!" This is a French expression that translates as promises are made to be kept. As promised, this is the recipe of the vegetarian equivalent of fish caviar that I served my "vegetarian" dinner guests last night. I paired it with mini-crumpets and a little dollop of crème fraîche in between. 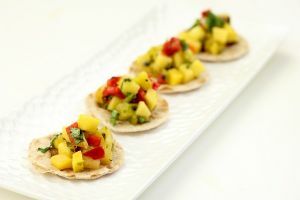 This recipe was inspired by the Tassajara Cookbook by Karla Oliveira, which is an excellent resource for vegetarian party food recipes. The quinoa grains and eggplant seeds resemble the original fish eggs. It is basically eggplant caviar, very similar to baba ganoush, mixed with cooked quinoa. 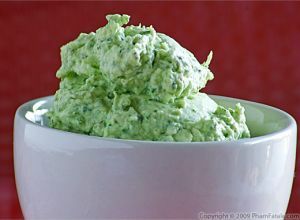 For more flavor, I topped it with an Asian-style mint and cilantro sauce that added a beautiful, bright green color. Wash the eggplant and pat it dry. Cut the eggplant in half. Brush the skin with oil. Reserve one half. Season this half with 1/2 teaspoon of salt. Set aside. Place a grill on your stove, then char all the skin of the other half of the eggplant as you would with bell peppers (see tips). Wrap in aluminum foil. Place this half on a greased baking sheet as well as the other half of the eggplant, skin side down. Bake for about 35 minutes. The flesh of the eggplant should be soft. Let the eggplant cool for about 15 minutes. Remove the skin. Scoop all the eggplant flesh onto a cutting board. Chop it finely into a puree. Transfer into a bowl. Set aside until the rest is ready. 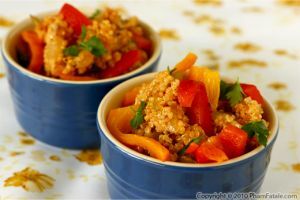 In a medium-sized pan, combine the quinoa with water. Bring to a boil, then lower the heat to a gentle simmer. Cook, uncovered, for about 20 minutes. Add about 1/2 teaspoon of salt. Stir to prevent the grains from sticking. You want to make sure that the heat is on low. Cover and cook for another 15 minutes. This might take longer than the cooking instructions on the package but this way, the quinoa will be nice and tender. Fluff the quinoa with a fork. Let it cool completely. Set aside. In a bowl, combine the chopped nori, the apple juice and soy sauce. Set aside. In a small pan, heat the walnut oil. Add half the amount of the onions and mustard seeds and cook until they are slightly golden (3-4 minutes). Add the ginger garlic paste. Cook for another minute. Add the nori mixture with its liquid. Turn off the heat. Season with fleur de sel and pepper. Let it cool completely. In a blender or a mini-blender if you have one, mix the onion/nori mixture, the roasted jalapeño, mint, cilantro, sugar, rice vinegar and the rest of the red onion. Add more apple juice (about 1-1/2 tablespoons) if the blender does not flow smoothly. Set aside. In a large bowl, combine the mint/cilantro sauce, the roasted eggplant and the quinoa. Plastic wrap and chill in the refrigerator until you are ready to serve. Place all the crumpets on a serving platter. Spoon about 1/2 tablespoon of crème fraîche on each crumpet. Top with a tablespoon of quinoa and eggplant caviar. Garnish with a leaf of cilantro. Quick note on how to make your own crème fraîche: Just heat about a cup of heavy cream (do NOT boil). Using a thermometer, the temperature should be between 105°F to 120°F. 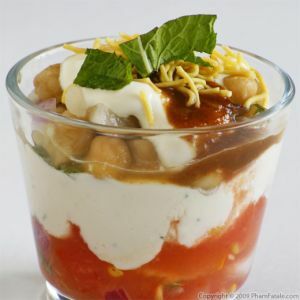 The temperature should not exceed 130°F or the lactobacilli bacteria that curdles the cream will die. Turn off the heat. Add a tablespoon of buttermilk to make it curdle. Transfer all the dairy mixture into a bowl, cover with a kitchen towel and place it in a warm area (like next to the stove). Let the bowl rest at least 8 hours. Stir. The longer you wait, the more tart the flavor will be. Depending on the season (it's much faster during the summer), let the mixture stand for a total of one day, up to 1-1/2 days. Plastic-wrap the thickened cream and store in the refrigerator for up to 2 weeks. It's delicious. You can substitute sour cream for the crème fraîche but I find the texture and taste to be different. 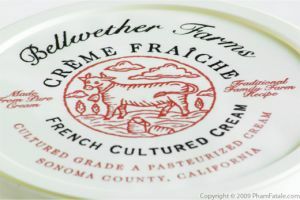 Quick fact: crème fraîche has more flavor with 28% fat whereas sour cream contains "only" between 12 and 16%. I know what you're thinking... calories. I keep repeating myself but "to heck with calories, that why's they invented treadmills!" Roasting chili peppers is very easy; it's the same method as roasting bell peppers. Once you know how to make them yourself, you'll never buy the ones in a jar again. To start with, cut the stem off the jalapeño. Wash it, pat it dry, then brush it with oil. Place a grill on your stove, then char all the skin of the jalapeño. Wrap in aluminum foil. Let cool for about 5-10 minutes. Clean the chili using a knife; the skin will come right off. Seed it, then finely chop the flesh. Voilà! I charred only half of the eggplant. The roasting gives it a nice smoky flavor. I didn't roast the entire eggplant because too much can be overpowering. Another solution would be to roast the entire eggplant in the oven (without roasting on the stove) and add a drop of liquid smoke. Cooking quinoa is ultra simple. It's very similar to cooking jasmine rice: count one part of uncooked quinoa for 2 parts water. I added chopped nori to the caviar to resemble the taste of real caviar but you don't have to. Nori doesn't change the texture of the caviar. Remove the caviar 30 minutes prior to serving. You want to make sure the caviar is chilled but not ice cold. I place the caviar on top of each crumpet using the quenelle method. Using 2 spoons, gather one portion of the caviar in one spoon. Scrape the loose mixture from the sides using the other spoon. Repeat until all the quinoa is nicely packed, playing with the 2 spoons. Push the egg-shaped lump with the other spoon onto the crumpet. You'll get an elegant, handcrafted form. Serve immediately. 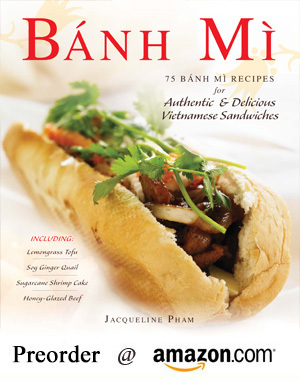 Published By: Jacqueline Pham on July 11, 2009. Lovely & excellent appetizers! MMMMMMMMMMMMMMMMMM,....!!! this is so awesome! using quinos for caviar is a genius idea. they look so beautiful! Great recipe. Love your site! So glad you left a comment on my blog so I could see this wonderful post! You are so talented. Hey Jackie, this looks look a of love and care. Was it worth it? You can't see this but I am giving you a standing ovation. Wow....that is a great looking appetizer. And beyond that...a wonderful answer to a vegetarian dinner. Amazing. Great photography too! Love it! I like this version of vegetarian caviar. 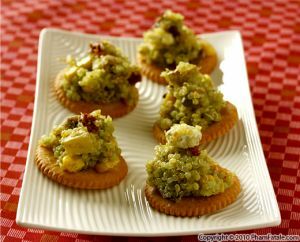 Perfect appetizer for party and very nicely presented as well. Wow - what a fantastic appetizer! So pretty and I love that "caviar" on top - so creative!! great use of the crumpets. These are gorgeous. I can't tell you how fantastic this vegetarian caviar is!! I loved the crumpets but said I'd rather have it with butter and jam. After seeing this, I take it all back! I was so proud of myself for making crème fraîche that now I'll seize any reason/excuse to make some. These appetizers are a keeper! as Enfield would say... NO! how creative and whimsical is this? 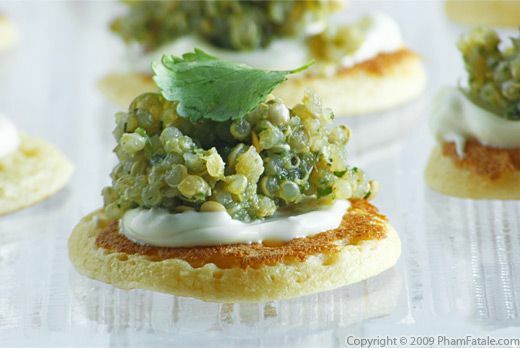 AMAZING idea to use quinoa as "caviar"! Your guests were treated with a beautiful appetizer. I love this idea! What a fun play on caviar...and the green color is so vibrant! Very nice! I will have to try it sometime. 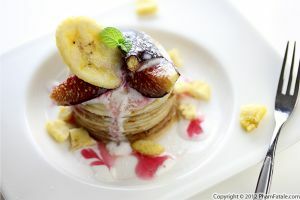 This looks like one intricate recipe! Love eggplant. this looks soooo good. It is inspiring me to have a dinner party! I love the idea of this! I would have never thought of such a thing, but now I have to try it! Nice site! I just got eggplant, jalpenos ans cilantro from my garden this morning. Thanks for the recipe! Can I make it? Buy it? What?